Custom logo support and more! 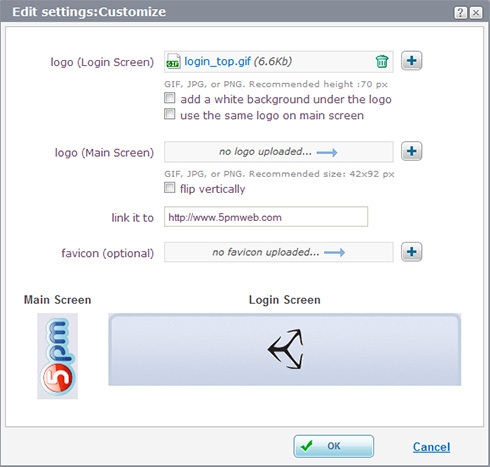 We just added to 5pm the Customization screen (accessible through the Settings window) that gives you the possibility to upload your own logo to your 5pm account, link it to your site and even replace the favicon. This really should be more visible. Every other PM solution offers “custom branding” and I was just about to pass on 5pm specifically because there wasn’t anything about branding in the Tour. The “custom branding” function is a good idea so that the user have “their own” workplace. Is it possible to brand each project with a different logo? An even cooler arrangement might be to have company.5pmweb.com mapped to a subdomain on our domain (CNAME) and then subdirectories that used the client’s name. Or if it had to be per project, that’s cool, we would just name our projects like Client-proj1 etc. The logo is shared between all the projects. When I load my logo for the login page it shows it turned 90 degrees. The logo size is also VERY small. It is also VERY small on the main screen of the account. There should be the option for sizing and customization of colors in order to help further brand the page. You can turn the rotation on and off. The size depends on the size you upload – plus we re-size to fit it into our design. Hi! How is the custom branding work? Is it possible for users to login into 5pm space using eg: mydomain.com/projects instead of mydomain.5pmweb.com or any other way which will not show 5pmweb.com? Can it e fully cutomized? Custom branding just replaces our logo with yours. The domain can not be outside 5pm domain. Next post: 5pm celebrates its 3-year anniversary! Previous post: 5pm speaks Korean!